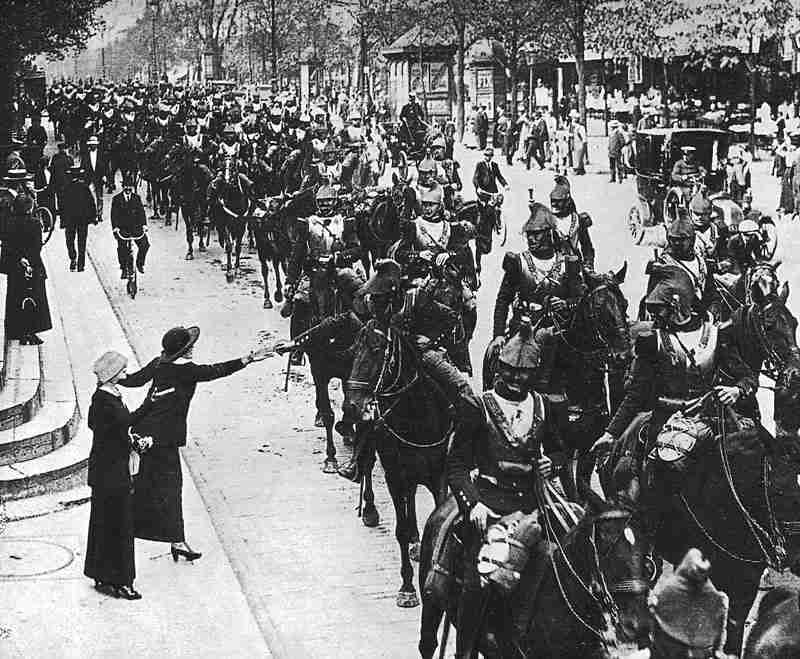 Crowds in Paris turn out to watch the departure of the heavy Cuirassiers cavalry for the front at the height of the August 1914 fighting. War Diary of World War One starting from 1914. This War Diary of World War One is an accurate day-by-day chronology of the events from Sunday Friday, June 28, 1914 with the Assassination of Archduke Francis Ferdinand and his wife at Sarajevo and will end probably with the final closing of the hostilities in Europe well after 1918. Because we have to remember, that there was a turbulent aftermath: war for Bolshevik Russia, Poland, Greece and Turkey for example was not over with the armistice signed on November 11, 1918. Every day a new entry with the events of the same day – 100 years ago – will be added. Perhaps chronologies are off-putting to modern historians and bloggers as well as to readers. Yet chronology is the backbone of history, and can be popular. All too often today it is treated both in general and particu­lar works of scholarship with infuriating vagueness. Even official histories and sources can disagree on the dates of the most crucial and recent events. This War Diary is an attempt to chronicle the day-by-day events and mood of World War One from the perspective and resources of our times. The 12 categories facilitate a coherent thematic approach. It is important to note that linked events, not just military operations over several days, in the same month are often consolidated into a single day’s entry. The War Diary does not cover the internal events of the contemporary Portuguese, Mexican and Chinese Revolutions. Events in neutral countries unattributable to 1914-18 are similarly ignored. Place names are the ones used at the time, hence Lemberg not Lvov. Many Eastern Europa place names in particular have undergone many baffling change since 1914-18, not to mention many variations in their spelling then and now. The term ‘British’ is used often been used to denote any forces of the British Empire especially when several of its nationalities were involved. In the case of the Dual Monarchy of Austria-Hungary, often just the therm ‘Austria’ has been used to be shorter. ‘Turkey, Turkish or Turk’ is used even for the Ottoman Empire and its troops. Russia did not adopt the New Style Gregorian calendar until January 31, 1918 but it has applied here before for uniformity. Be aware that the Old Style Julian Calendar meant Russia was 13 days behind the rest of Europe excluding Bulgaria (changed 1915); Turkey (1918); Rumania and Serbia (1919); and Greece (1923). This discrepancy is inevitably a fertile source of confusion. However, the most common variation is 24 hours either side of a given date and sometimes the choice can be little more than guesswork.